Wireless Technologies Overview - Phase IV Engineering Inc. Phase IV is the only wireless sensor company that offers products, custom design services, and expert help with every wireless technology. We’ve built 20+ year relationships with our partners by offering them the latest cutting-edge wireless option for each sensing need. With our broad experience across industries, we know there’s not a “one size fits all” solution. We can help you, too. – no battery to ever change. inside walls, carbon fiber panels, rubber, pavement… because they never need to be maintained. 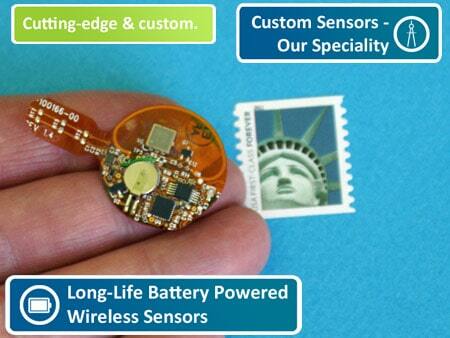 With no battery and few components, these sensors can be incredibly small. 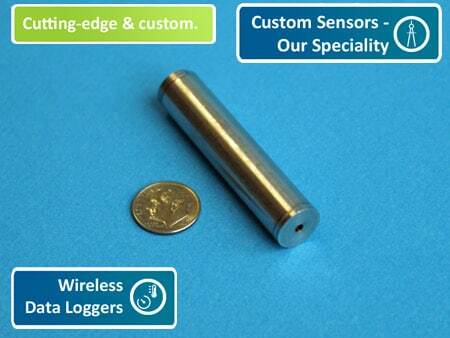 With no battery to change, the sensors can be encapsulated and put in very harsh environments. Phase IV’s SensIC LF RFID chip is operates across an incredible range of -50C to 170C. by the same RFID reader using the standard EPC RFID “anti-collision” protocol. 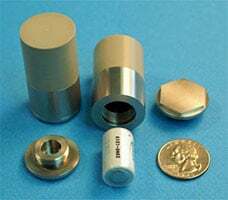 UHF sensors can be placed directly against a metal surface and still effectively transmit sensor data. that vary from an inch (for LF and HF sensors) to ~15 feet for UHF-EPC RFID systems. 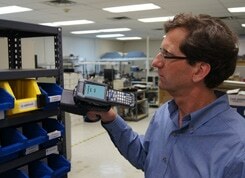 RFID readers range from $300 to $4000. for the sensor and reader may be required for long read ranges. are required to read some RFID sensors, so not every RFID reader can read an RFID sensor. or require custom development to match the low-power requirements of an RFID circuit to a sensor. are sometimes required to “harvest” the radio energy in different application environments. Phase IV invented RFID battery-free sensing and is the recognized world’s expert in the technology. We continue to push the technology to new levels of performance. Phase IV is the only wireless sensing company that offers every type of RFID wireless technology including – Low Frequency (LF), High Frequency (HF), Ultra High Frequency (UHF-EPC), Near Field Communication (NFC), and Custom Proprietary Protocol RFID sensors. For more detailed information on RFID sensors – and the different types of RFID sensors, see the RFID battery-free (passive) systems page. 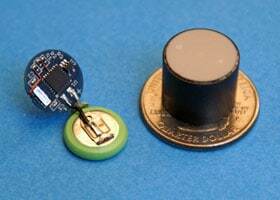 Battery-Assisted Passive (BAP) RFID sensors use a small battery to power the sensor. 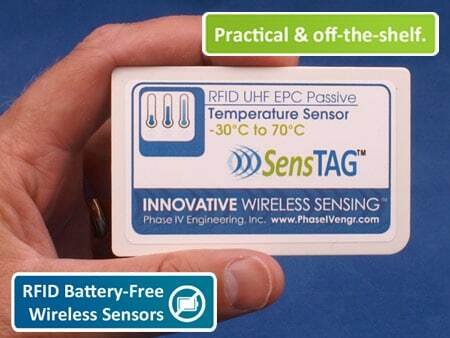 While not as small as battery-free (passive) RFID sensors, the trade-off is a longer read-range. 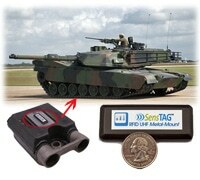 BAP RFID sensors are ideal in hard-to-reach applications where it’s not possible to get a reading from 3-foot distance. Phase IV has developed a cutting-edge BAP technology with a 10-year life, making our RFID-BAP sensors practically battery-free™. 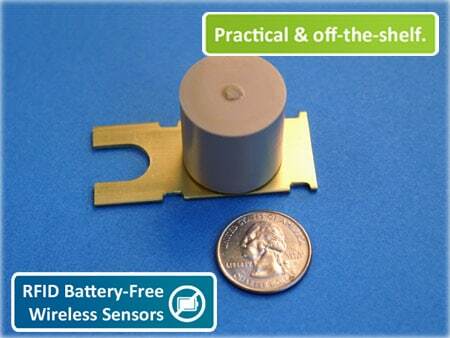 Learn More about our Battery-Assisted Passive RFID Sensors. – typically 300 feet in open air. 30 feet for our custom medical devices. 1000+ feet for custom industrial sensors. The range may easily be extended for some sensor systems using remotely located radio repeaters. makes many of these sensors “Practically Battery Free™”. We leverage our experience with designing ultra-low-power circuits to achieve battery lives of 4 years for compact sensors and 10 years for industrial sensors. 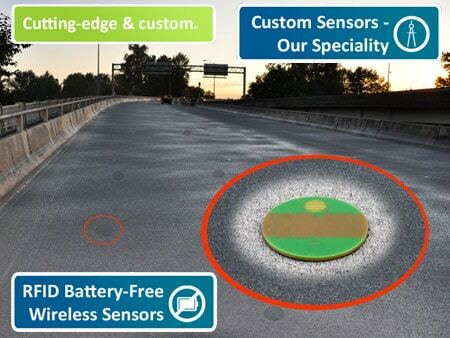 possible with sensors that constantly “beacon” their data at regular intervals. that are easy to install and very practical to use. – so immediate corrective action may be taken if the sensors indicate a problem. can support a large number of sensors. through the software or web interface. Sensor transmission interval, battery level, alerts, etc. without running expensive wires and conduit. Join the “Internet of Things” in minutes! by utilizing a “keep it simple” network structure. and thus require ongoing maintenance. Ultra-miniature sensors have battery lives of a few days. Industrial sensors have battery lives of 10+ years, depending on how the sensor is configured. is typical due to large batteries and large antennas that are required for long transmission distances. because of the large size and need to change batteries. that can can make data storage and analysis difficult. Data transmissions are subject to rare but occasional interference. Wireless sensors are only intended for supplemental monitoring and not applications where safety may be impacted or a lost signal may cause undesired consequences. Radio transmissions cannot pass through metal. A path between the sensor and receiver may not be blocked by a metal enclosure or large metal structures. Phase IV offers an easy to use and practical “off the shelf” Wireless Sensor Network (WSN) system with a wide variety of sensors. We also offer some very specialized custom active sensor systems for application that have unique or demanding requirements. 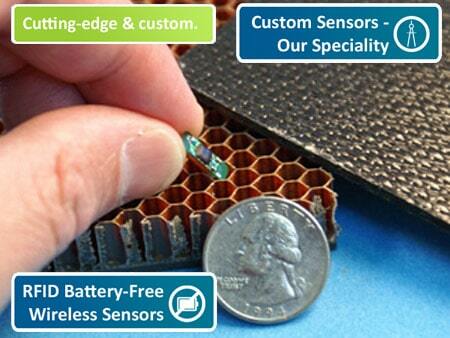 For more detailed information on RFID sensors see the Battery-powered (Active) Wireless Sensors page. – such as metal containers or cans. – such as very thin and narrow spaces. where power, receivers, or computer connections are not always available. such as shipping temperature sensitive medicine or fresh produce to destinations that are hundreds of miles away. that need to be monitored. For example, the Micro-T data logger has a size and density of a typical food morsel. Sensor data is not seen in 'real time'. If there is a problem with a sensor reading, it will not be seen until the data is downloaded. That can often be days or weeks after a sensor threshold is exceeded. because the battery is sealed inside the enclosure. by a dedicated person using a computer. RFID technology typically has a limited transmission distance. 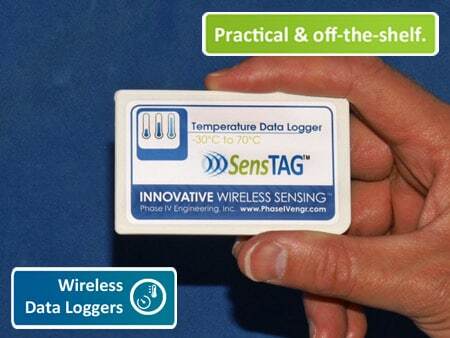 Data loggers are devices that periodically take a sensor reading and then store the time-stamped sensor data to on-board memory. At a later time, the data is downloaded to a computer for analysis. 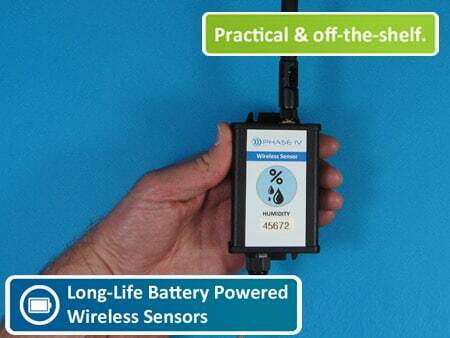 Phase IV offers several data loggers with a wireless RFID interface. 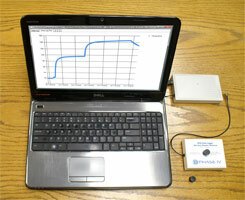 A computer is connected to a RFID reader – and the reader communicates with the data logger to download data and control how the data logger collects data (start time, stop time, sampling interval…). The RFID interface is very advantageous over other non-RFID data loggers because no battery power is required for the data logger to transmit data or commands to the PC. 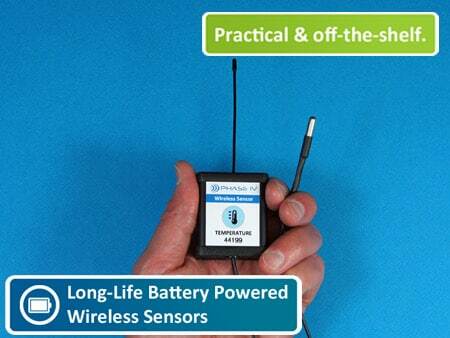 Because RFID data loggers do not use any battery power to transmit data, they use batteries that are much much smaller than active wireless data loggers. 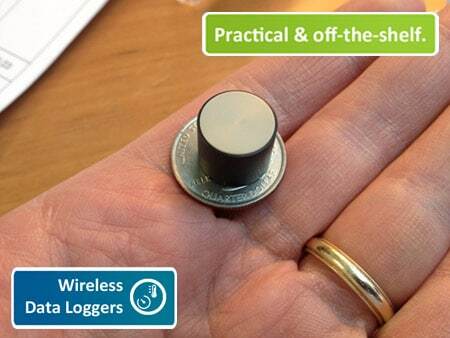 We leverage our expertise with RFID sensing to create several versions of the world’s smallest sealed data loggers. For more detailed information on RFID sensors – and the different types of RFID sensors, see the RFID Data Logger page.